ATOMOS VI one of the video pieces will be directed by me on the occasion of the release of ATOMOS, the new opus of A Winged Victory For The Sullen composed by Adam Bryanbaum Wiltzie and Dustin O’Halloran. The idea is to use this concept of literature in the form of an image accompanied by music, making the cyclist who represent the image an epicentre figure, as the main pattern. 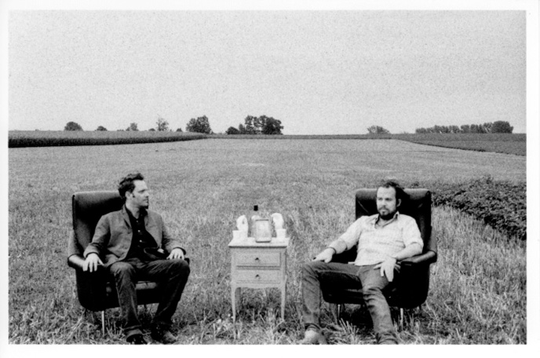 A Winged Victory For The Sullen is the reunion of two minimalism music’s masters: Dustin O'Halloran is a Californian composer who worked among others on the soundtrack of Sofia Coppola’s Marie Antoinette. Founder of the band Dream Devics pop, he is the author of several recordings in contemporary piano classic music. Adam Bryanbaum Wiltzie is the founder of different cult groups such as Stars of the Lid and The Dead Texan, he also was a musician for Sparklehorse. Published by the prestigious label Kranky USA, their first album A Winged Victory For The Sullen is, according to its creators, a response to twenty years of research in ambient music: based on sheets of strings and guitar effects, their music is a smooth journey through the ether. In live concert, Dustin (piano) and Adam (guitar) are accompanied by a string quartet (cello, violins, viola). Scheduled for October, their new album ATOMOS is also the soundtrack for an eponymous dance performance of the famous choreographer Wayne McGregor. The video clip is divided into two parts. Each of it lasts about three minutes whilst the song is of 6’03 long. 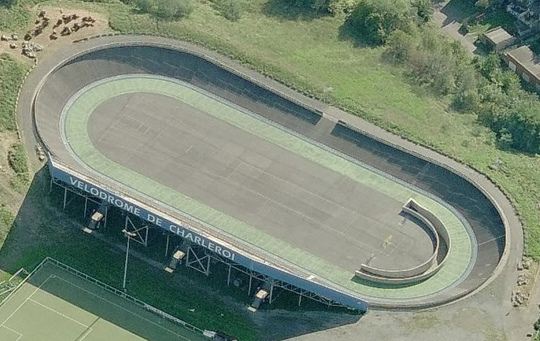 The first part will be shot at the Charleroi’s velodrome: a dizzying mass of concrete for a 250 meters long racetrack which inspired me. Step by step, three cyclists will begin some kind of choreography, consisting of sprints, isolated bikes, escapes and synchronised sports gestures. At twilight, little LED lamps, sewed at leg level, on the torsos and on the backs of the riders, will start to light up in the aim of depicting their body on the dark in an idea of evoking motion capture. Eventually, the movements will become abstract clouds of light: nor bikes nor bodies will be finally visible, when the mere idea of the pure movement will be preserved. 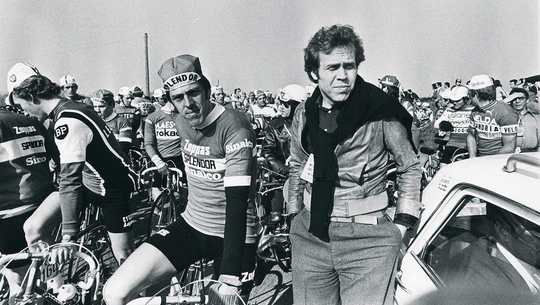 The second part is a re-edition of certain scenes from two movies by Jørgen Leth, a Danish director who has always been passionate with cycling races. He considers it as a ritual expression of human victory – or loss. Through A Sunday In Hell (1976) and The Impossible Hour (1974), he nurtured the poetical string of cycling and its eternal races. This sublime character of the cyclist as a figure of the movement, with its wheel and roundness, is the ground of my inspiration for this short movie. On the right here: Jørgen Leth, who gave us very friendly the rights on his two films for our project. 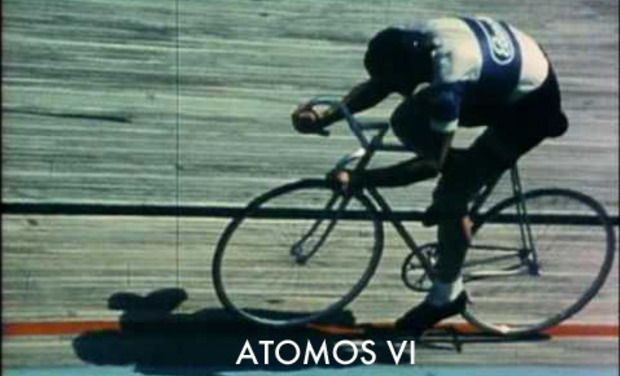 This ATOMOS VI video is dedicated to him. The music of AWVFTS is indeed full of theatrically grounded and it has a story of its own. 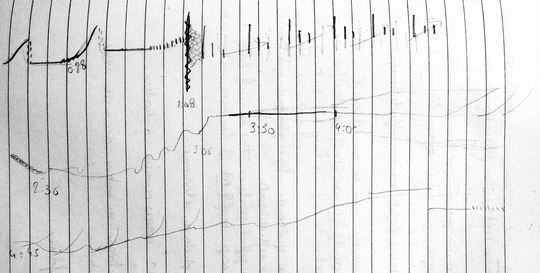 This is why I decided to interpret it through a single, repetitive pattern and not through narrative images which would have break the reading and the listening of the music. A man advances through a narrow passage surrounded by high walls of concrete; he holds a bike with one hand. The long corridor opens on a huge velodrome surrounded by trees and greenery. Vertiginous asphalt terraces dominate the massive structure. All the old structure is grey and green. On his own, the man enters the velodrome as if he was penetrating an arena. Once on the tracks, he gets on his bike and gently speeds up. He is simply dressed with a long sleeve T-shirt and a dark trouser. On his arms and legs are small sewn LED – though they do not shine for the moment. As the ride begins, the music starts. He makes this strong effort deeply focused and slowly fuse with Charleroi’s velodrome. Loving this speed, the cyclist rides faster and faster, splitting air on his passage whilst the landscape only appears to him as drag colours. It is all about speed and mere movement here, sport as a first gesture. He majestically slides down the track. A second cyclist suddenly gets on the track. And then a third one. In an interrupted marathon they catch up with the first cyclist. As they run against the wind, they undertake all the three a dance of escapement and double turn-by-turn. Once lined up as Indian queue the cyclists ride at an identical speed: their movement is now synchronised. 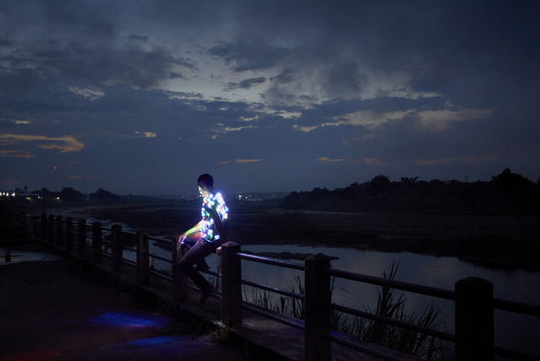 The day declines, mini LED that differentiate the joints of the cyclists’ bodies as a captured motion light up. A cloud of bright spots in a continuous movement lights up in the dark, in a vast space where darkness starts rocketing. A new platoon from the sky now appears. It is stemming from the film A Sunday in hell by Jørgen Leth (1976). Images from the Paris-Roubaix’s race fuse: a small country road lined with plane trees and surrounding fields fills the screen. The image has a frame and cyclists ahead of the pack, always following the majestic movement of the group of cyclist, taking turns a single synchronized movement. Gradually, the camera focuses on a single cyclist, who dominates the race, slowly leaving the group. We now imagine him alone on the road. We think of an atom that gets detached from the whole. 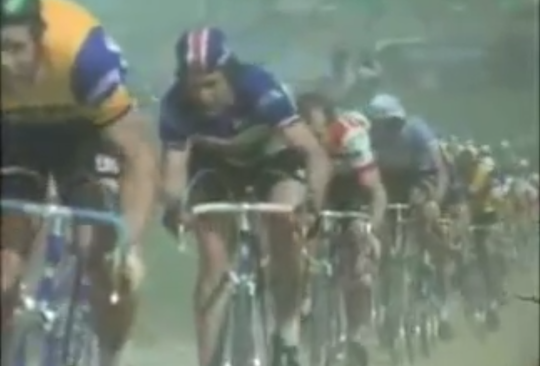 The pack is then filmed in slow motion, the bodies-bikes advance fighting in the dust of the Paris-Roubaix, disfigured as the effort seems to be superhuman. The image becomes slowly black and white; the camera leaves the group to find two isolated cyclists, the atoms. 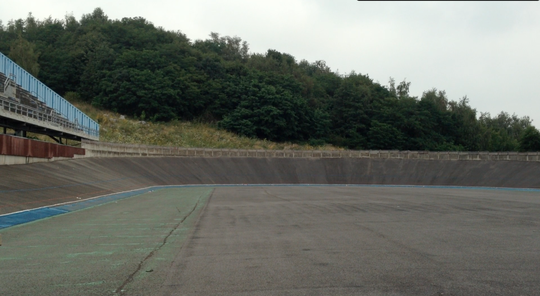 It is Ole Ritter and Eddy Merckx, they ride in turns on a single velodrome track. 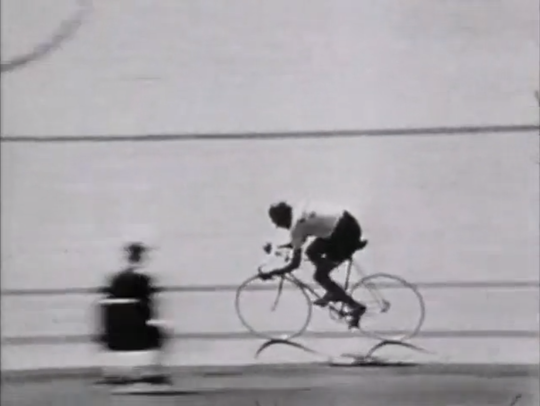 These images of an anticlockwise race are picked from Jørgen Leth’s The impossible hour. Amélie Derlon Cordina, French filmmaker born in December 1985. I am currently living in Brussels, for nearly three years. It was in the vicinity of Sainte Catherine's where I met Adam B.Wiltzie when we decided on my direction of music video. I come from Marseilles, where studied fine arts in a cinema-video workshop. I made two medium-length films, MANGE TES MORTS (Eat your bones), in 2011, filmed in Marseilles. Later, LES SUPPLIANTES (The Suppliants), in 2013, is an adaptation of the eponymous tragedy of Aeschylus, produced by the “GREC” (Groupement de Recherches et d’Essais Cinématographiques, with CNC) and Cinema 93 (aide au court du département de la Seine Saint Denis). All my films are potential adventures. My heroes are often what I would call “ restricted-adventurers” and the “nowhere” of towns and countryside are my favourite sets. The members of the AWVFTS are eager on producing a part of this video. However, I would like this movie to be as great as their music. Therefore, basic technical means are needed. [400 €] Rent two cameras and lenses, which will be able to put on screen the speed of the riders as well as the LEDs that will shine in the darkness. [70 €] Feed the whole team! Thank you so much! Some of my old film "Les Suppliantes" on DVD will be given, and we happily invite you to a private screening at Galeries Cinema (Brussels), where the whole team will be + a free drink ! Thank you a lot! We offer you ATOMOS the new album of AWVFTS, and we will invite you to a private screening at Galeries Cinema (Brussels), where the whole team will be + a free drink ! We are grateful for your support. Thank you! We offer the ATOMOS album + my DVD "Les Suppliantes". 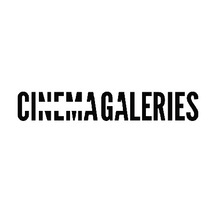 And we'll invite you to a private screening at Galeries Cinema (Brussels), where the whole team will be + free drink. We are really appreciative of your kind gesture. In addition to all we have already offered, we will invite you for a personal interaction with Adam and I. Come have a drink with us at the "DARING MAN" in Brussels!